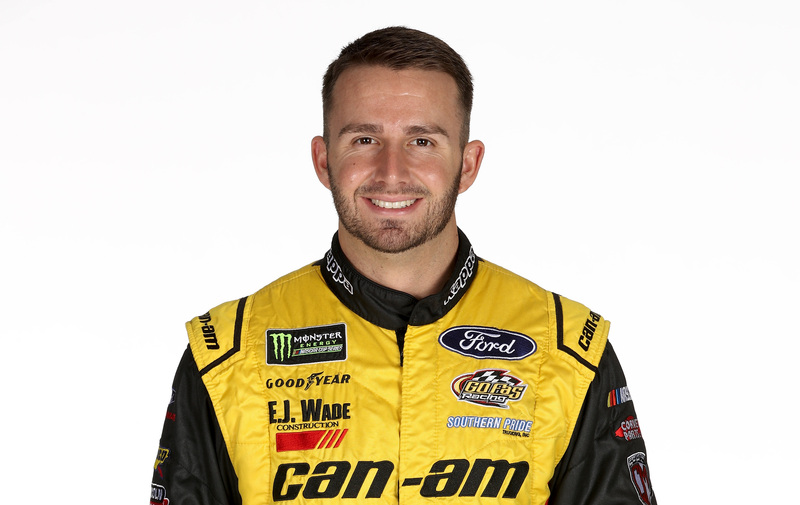 The series of 12 Questions driver interviews continues with Matt DiBenedetto, who drives the No. 32 car for Go Fas Racing. Oh man. I don’t dream a lot, but when I do, I would honestly say 50 percent of my dreams are about racing — which is a lot. So I would say probably once every couple of weeks. Are they just dreams where you’re driving the car, or does something happen in them? Winning. I’ve had a dream about my first Cup win multiple times. So it’s coming one of these years or days or whatever. Hopefully in the near future. If it’s just a racing deal or you do get into somebody, I don’t know if an apology is necessary. But maybe out of respect, if it’s something that needed confronting, definitely communication is key. When you leave things burning or unsaid, that could usually cause the worst outcomes. I like to be open book. Even kind of the unspoken respect I feel like I got from the drivers like (Kevin) Harvick and Denny (Hamlin) and Darrell Waltrip jumping in and actually sponsoring my car (at Phoenix), it’s amazing to have earned that respect from all of my peers that I’ve raced with. So that’s the biggest compliment I could ever get. 4. NASCAR comes to you and says, “Matt, we’re bringing a celebrity to the track and we’d love for you to host them.” Who is a celebrity you’d be really excited to host at a race? I think John Cena would be a really cool guy to hang out with and I like like he would just be really fun. I did the John Cena intro song at Bristol and I’m just a big fan of him. I think he just seems like a good person. Yeah. He’d get you in a good mood. Yes! Energetic. That’s what I like. Oh gosh. No. I actually would not. There’s a difference in eating for health and eating for performance, and I’ve learned a lot and I really buckled down on that this year — my fitness stuff and my health stuff and my eating. Like 10 times harder this year than ever. I’ve learned there’s a good balance; you need to eat your meat, you need to eat your chicken, and you need some carbs for performance. I’ve accidentally eaten really clean before. That sounds great, but like super, super clean where you don’t have near enough carbs, things like that — and I had no energy and my performance was awful. So I learned a lot about that. My crew chief, Randy Cox, has actually taught me a lot. I’ve buckled down big time, like I do CrossFit every week and I lift and I’ve been like working out like crazy and eating really well. I’m learning every day. So I can’t sacrifice the performance. I have terrible memory. This should be fun. This is the 2016 Bank of America 500, which was the Charlotte fall race. Oh man, I don’t even have a clue. Charlotte fall race 2016. So I was still with BK (Racing). I’m gonna guess 26th. Oh my gosh — 25th! Oh man! I thought it was an OK race. I vaguely remember it. You started 24th. You were the only one on your lap. I do remember our qualifying effort was good there. So yeah, we qualified in the second round and we had some good speed. Didn’t have as much speed in the race, but Charlotte’s up or down for me. I’ve had some really fast cars and some really bad luck there, so I don’t know which one that was. This one’s hard, but I don’t listen to a lot of rap. Does DMX count as a rapper? Yeah, that’s old school. Yeah, DMX. That’s one of my favorites. My answer may be kind of vague, but I’m gonna say every single one of them that I’m angry at during a race. Whoever I’m mad at at the current time. I’m a very high-tempered type of person, so it changes week to week, but some of the people that I race around, yeah — I’ve said on the radio many times I’m gonna get out and punch that guy in the face. So it’s been multiple people. I can’t single out one person. And that’s a letdown because then I would run to your car if I think it’s going to happen with my phone ready for the next fight — and then no. You are the master of that. I have a little bit of a temper with things. I’m either very, very calm, which I am usually 90 percent of the race, but if somebody makes me mad, I’m just like, “I’m gonna rip that guy of out of the car after the race, just beat the crap out of him.” Like I get that angry, so I don’t have a happy medium, unfortunately. OK. Well, just follow through one time so I can get it on video. (Laughs) I hope I don’t have to, but if I get mad enough where you see any big scuffle at the end of the race or something, definitely come to my car afterwards. No matter what happens, I like to confront outside the race car in person after the race. I’ve done that many times where you catch people off guard. If someone runs into my race car after the race or something like that, that’s it. I’m going right to their face after. And if they make me mad, then things are about to go down. Tom Hanks is gonna be my motorhome driver because he’s got great survival skills, so I’ll be well prepared in the coach. And then Taylor Swift would be my spotter because I would just want to hear her voice as much as humanly possible. And then LeBron would be calling the shots on the box. We usually scope that out beforehand, but usually when we’re riding around in the truck, you’re up a little higher and you’re on the track so you have a good vantage point. You can get in there and look, see where your car is parked and then have bird’s-eye view of, “OK, where’s the nearest port-a-potty?” or bathroom or whatever. I don’t know if I should give this tip away, but the really smart fans hang out near the bathrooms near the cars before the race and they get the most autographs out of everybody. Drivers actually sign there on the way to the bathroom? Yeah, kind of. There’s usually sometimes a line, we’re all kind of waiting in line, so we’ve got nothing to do. So yeah, a fan can come up before we walk in there and it’s not very many people, so it’s not like you’re fighting the crowds. So I’m giving them some pretty good tips. Oh my gosh. When I win a race, I’ll just be going insane anyway. There’d probably have to be like $20,000 on the line because I’d have to practice starting Monday every day for until the day leading up to when I win my race. because I can’t really do a backflip. If I practice, I’m sure I could do it — if there’s a will there’s a way — but for 20 grand, I’d make it happen. We might have to up that number, actually, because there’s still a good chance that I’d get hurt. So I don’t know, maybe up it to $50,000. 12. Each week, I ask a driver to give me a question for the next interview. Last week was Brad Keselowski, and his question for you was: How exactly did you become the darling of Reddit? How did that whole thing evolve? He was curious. That’s a good question. So the Reddit community has jumped on board behind me and us because I really genuinely just hung out in there and on there. As my career started to evolve and I started to become more successful and be in the Cup Series, they just thought it was cool that I was just in there and one of them and just hanging out and commenting, because there’s some really fun content in there that I enjoy. That was it. It super naturally and organically just built and because they thought it was so cool that a Cup driver was just chilling in there with them and commenting and having fun with them. I’ve even hosted races in iRacing and gave them all the password and told them, “Hey, jump in.” It fills up in a minute. So I don’t know. Just fun, normal stuff. Do you think they can propel you to the All-Star fan vote this year? Yeah, I do. This year I feel pretty confident that we have a good shot at it. It’s not gonna be easy, but obviously I’d like for Chase to race his way in because Chase is always, he’s a fan favorite. But either way, I think last year we may have even gotten more votes than Danica, from what I’ve heard. Don’t quote me on that, but for us to have last year gotten that many votes and been that close and if Chase had raced his way in, I think we would have been the fan vote. So for us to have done that last year, my fan base has done nothing but grow since then. I mean, I think we can make it happen. The Reddit community’s been a big part of that. I don’t know who the next interview is going to be with. Do you have a question I can ask another driver in general? I like hearing what drivers think of other drivers. Who do they think is going to be the next driver to be the next up-and-coming driver that’s going to be winning races in the Cup Series in the years to come? So who’s gonna be the next breakthrough guy that emerges on the scene and starts winning races? Yeah, whether they’re in Cup now or in Xfinity, whatever it may be, who do they think will be the next guy that’s gonna be the new Kyle Larson or something. It could be somebody like me, it could be Christopher Bell, there’s lots of options like that.